CRPC Therapeutics Market is expected to garner $9.5 billion by 2020, registering a CAGR of 9.1% during the forecast period 2015-2020. Castration-Resistant Prostate Cancer (CRPC) or Hormone Refractory Prostate Cancer (CRPC), a type of prostate cancer that typically recurs after administering androgen deprivation therapy (ADT), is gaining prominence in the prostate cancer market. The global CRPC market is poised to expand at a significant pace, owing to high unmet clinical need, limited survival benefits, growing prevalence rates and fast emerging treatment modifications. The market growth would pivot around the novel breakthrough treatments responsible for reaping survival benefits. The survival benefit would be instrumental in governing the peak sales and market penetration of novel approved drugs. Promising drug pipeline, evolving treatment patterns, emerging untapped non-metastatic CRPC space and augmented patient awareness are the factors that are expected to boost the market growth. Further, untapped CRPC market in the Asia-Pacific and LAMEA region would also accelerate the overall market growth during the forecast period. Untapped non-metastatic CRPC settings would further bolster the market growth. On the other hand, factors such as premium pricing of CRPC drugs, uncertain reimbursement policies and lack of differentiation in mechanism of action among the approved and novel agents are likely to curtail the market growth. The market would gain traction in the developing regions of Asia-Pacific and third-world countries such as Africa and Latin America. The large undiagnosed patient population, rapid urbanization, rising disposable income, improved government funding towards cancer and growing awareness about prostate cancer would be some of the prime reasons responsible for the unparalleled market growth in these regions. However, oncologists/urologists reluctance towards adoption of these premium treatments in countries like India and China would continue to remain a key challenge for the leading innovators. To provide a detailed market assessment, the report segments the CRPC market on the basis of therapy type, drug delivery method and geography. Based on therapy type, the market is segmented across various segments such as Chemotherapy, Hormonal Therapy, Immunotherapy and Radiotherapy. Hormonal therapy segment spearheads the therapy types market, governing around 4/5th of the global market value in 2014 and would continue to maintain its market position during the forecast period (2015-2020). Radiation therapy segment is projected as the fastest growing segment throughout the forecast period. Based on drug delivery method, the market is segmented into oral and injectable therapy segments. Oral therapy segment dominates the global CRPC market; however, injectable segment is expected to grow at a faster rate. The report covers a geographic breakdown and a detailed analysis of each of the aforesaid segments across North America, Europe, Asia Pacific and LAMEA regions. 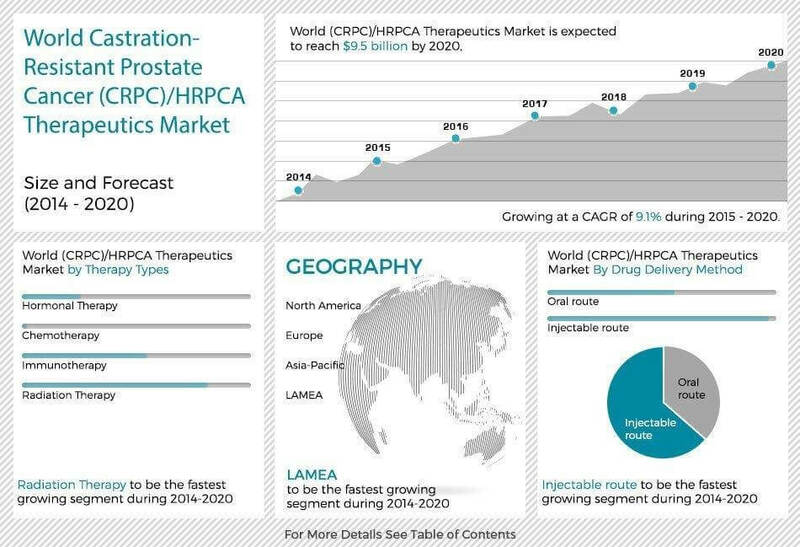 North America region governs a dominant share in the global CRPC market; however, Asia-Pacific and LAMEA region are expected to register the highest CAGR during the forecast period. The market registered substantial growth in the recent years, owing to the various strategies adopted by leading market players. One of the key strategies adopted is collaboration agreement. Astellas Pharma Inc. for instance in 2009, entered into an agreement with Medivation, Inc. to co-develop and co-commercialize MDV3100 (now Xtandi) for the treatment of CRPC. A comprehensive competitive analysis and profiles of major market players such as Astellas Inc., Johnson & Johnson, Sanofi S.A, Dendreon Corporation, Bayer AG, and others have been provided in the report. "Castration-Resistant Prostate Cancer (CRPC)/HRPCA Therapeutics Market"